When One Of The Shock-Absorbing Pads That Lie Between The Vertebrae Of The Spinal Column Becomes Displaced And Protrudes, It’s Called A Slipped Disc. Doctors Refer To The State As A Prolapsed Or Herniated Disc. A slipped disc is most common between the ages of 25 and 45 and is somewhat more common in men. Being heavy and lifting things wrong are risk factors. The shock-absorbing disks between the vertebrae contain a solid, fibrous outer layer and a soft, gelatinous center. A prolapsed disk happens when the center pushes outwards, distorting the shape of the disk. If the outer layer ruptures, the state is termed a herniated disc. When a disk prolapses or herniates, the surrounding tissues become inflamed and swollen. Jointly with the disk, the tissues may press on a spinal nerve, causing pain down the span of that nerve, the most common being the sciatic nerve, giving rise to sciatica. After about the age of 25, the disks start to dry out, being driest on awakening, so strenuous task affecting the back should not be undertaken without a great warmup routine. Disks also become more exposed to prolapse or herniation as an effect of the ordinary stress of daily life and slight harm. Occasionally damage to a disk is the result of a sharp bending or twisting motion or by lifting a heavy item incorrect. From about the age of 45, fibrous tissue forms around the disks, finally stabilizing them and making them less likely to be damaged. muscle spasm and stiffness around the affected region which makes movement difficult and pain much worse. weakness or controlled motion in your leg or arm. The pain is generally relieved by rest but can be made worse by walking upstairs, sitting, coughing, sneezing or bending. Bowel movements may also aggravate the pain. Reduced bladder or bowel function may signal pressure on the spinal cord, and you should consult a physician promptly. Xrays will rule out other causes of back pain, like spondylosis. MRI (magnetic resonance imaging) or CT (computerized tomography) scan will situate the location of the prolapsed or herniated disc correctly. 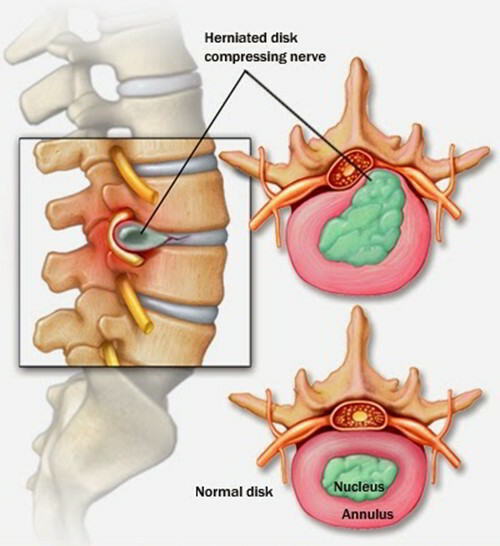 Even if the disk is forever damaged, the pain generally improves over 6-8 weeks as the swelling subsides. Your physician will propose bed rest and pain medicine. In case you are free of pain, physiotherapy and exercises may help reduce muscle spasms and hasten healing. For persisent pain, you are going to need referral to a hospital. Infrequently, pain may be alleviated with traction, at whichat which back is lightly extended with weights to create more space around the nerves, reducing pressure on and around them. Some individuals may reap the benefits of a particular nerve root block, in which a local anaesthetic, occasionally combined with a corticosteroid drug, is injected around the compressed nerve to decrease swelling. Sometimes surgery is needed to decompress the affected nerve root. Microdiscectomy is a surgical procedure used to treat a prolapsed or herniated disc pressing on a spinal nerve or the spinal cord. The protruding part of the disk is removed through an incision in the fibrous outer layer of the disk using an operating microscope. The procedure is performed under general anaesthetic and requires a short stay in hospital.